Atheists Know The Most About Religion. Duh. The Pew Forum on Religion & Public Life found that atheists know the most about religion and education makes a big difference. 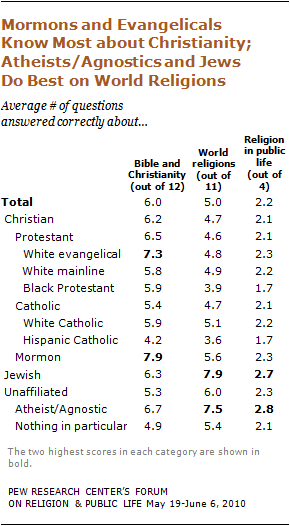 The Pew Forum on Religion & Public Life wanted to know how much Americans know about religion and who knows what. Sampling 3, 412 people with 32 questions, they found results that in some ways are not at all surprising, but in some ways are. Atheists, unsurprisingly, scored the highest. I shouldn’t generalize (given there is no research on atheist identity development, there is little alternative), but it would seem to me the reason a lot of atheists are atheists is because they know a lot about religion. The more you know, the more it doesn’t make sense. I found it interesting that Jews scored so high, but I wonder how many of those Jews are actually practicing Jews? Judaism is as much a cultural identifier as a religious one. There’s no evidence to speculate, but it seems a worthwhile question to investigate. I was not surprised that Mormons also scored relatively high, because it makes sense. They spend so much time preparing for and embarking on missionary work that I’m sure they have to prepare themselves to respond to what non-Mormon Christians and other religions might say in response to their evangelism. Just like atheists see how nonsensical other religions can be so they abandon them, perhaps Mormons see how nonsensical other religions can be as some sort of strange cognitive reinforcement for how bizarre Joseph Smith’s teachings were. What should also be alarming is the lowest scores. Black Protestants and Hispanic Catholics scored lower than individuals who are apathetic about religion. What does this say about what they are being taught (and not taught) in their communities? Perhaps this finding helps make more sense about the Prop 8 vote. It’s not that people of color were responsible for Prop 8 passing (that’s an awfully untrue myth), but perhaps there is some real concern about how indoctrinated they are or how narrow their understandings are outside their religious communities. Given that those two groups also scored considerably lower on the questions about religion in public life, this makes some sense. I wish there had been more than just four questions about religion in public life, because I would think that would be the most interesting result. It’s certainly the one with the most implications for our society. Given the prevalence of Christian privilege in our country, it makes sense that Jews and Atheists would make it a priority to know more about religion in public life so they can counter the abuses of that Christian Privilege. I have to say I’m a little disappointed in my fellow atheists that they didn’t know more about Christianity. They need to get on that. This survey and previous Pew Forum studies have shown that Jews and atheists/agnostics have high levels of educational attainment on average, which partially explains their performance on the religious knowledge survey. However, even after controlling for levels of education and other key demographic traits (race, age, gender and region), significant differences in religious knowledge persist among adherents of various faith traditions. 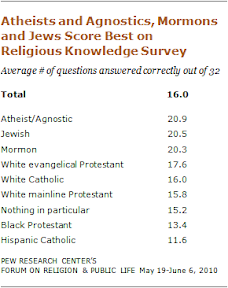 Atheists/agnostics, Jews and Mormons still have the highest levels of religious knowledge, followed by evangelical Protestants, then those whose religion is nothing in particular, mainline Protestants and Catholics. 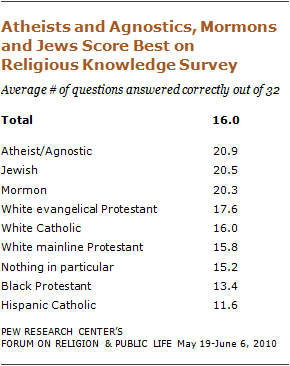 Atheists/agnostics and Jews stand out for high levels of knowledge about world religions other than Christianity, though they also score at or above the national average on questions about the Bible and Christianity. It’s amazing to me that higher education has such an impact on religious knowledge despite the fact that conversations around “spiritual development” generally involve a focus on keeping students on the same track they’re already on. I can only imagine how much bigger the difference would be if all college students were given the opportunity to think critically about their religious beliefs. I think more atheists should be religious leaders. I mean, they know the most; isn’t that the most important qualification? Maybe then religious followers would learn all the awful things that are in the Bible and how nonsensical their beliefs actually are. And my last thought on this study? Everyone should study religion more. It is the framework of our society, you know.